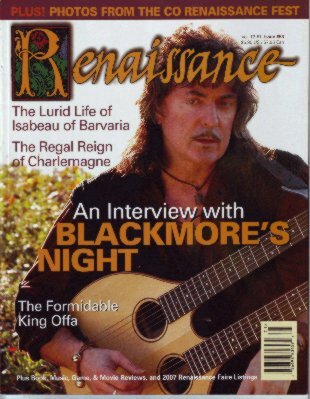 As we announced earlier, Blackmore’s Night are featured in issue 53 of the Renaissance magazine. Ritchie is on the cover and there is an extended interview with both him and Candice. You can subscribe and order back issues on their web site, although issue 53 is not in the back catalogue yet. UK Fan Club site has a long way to go in terms of filling it with the content, but already has a lively forum. Norwegian site has an English section which is so far empty, Brazilian site is all in Portuguese. Being linguistically challenged in both languages, I can’t comment on the contents of either. Nevertheless, we wish them all good luck! Thanks to Mike Garrett for the info. Posted by Nick Soveiko on Thursday, March 1st, 2007, filed under News. You can follow comment on this post through the RSS 2.0 feed. You can leave a comment below, or trackback from your own site. I am a DP fan and I care. The Brazilian fan site of Blackmore’s Night is a great work of the fans, with foruns and actually news, organized by Ellen. And for the visitors, twice simultaneous languages: portuguese and english. Visit. I wonder why Blackmores Night still exist. There is so much crap written about them. I guess his brain is elsewhere. Chucked his guitar. And taken us all for suckers. Melody is nice. But hell, it is sounding the same Ritchie! It is boring! Pick up that strat and show us just what it is that made you and gave you that £/$ in your pocket. You sold us out. I don’t care if it is Rainbow or Deep Purple just play that strat! Steve morse is a great guitarest; But he is a not as dexterous, nor as interesting to watch. Sorry Steve. ritchie blackmore is an absolutely brilliant musician no matter what he does! sure his musical direction in last few years has been rather odd, to say the least, but lest we forget ritchie is the man that wrote all the incredible guitar lines for deep purplea best songs, he is a genius and deep purple is not really deep purple without him on guitar (no offence steve morse) …i just hope one day that blackmore will but differences aside and tour with deep purple one last time!! i hope that ritchie to come again on deep purple!! but deep purple with steve morse are very strong and have power! so,i hope to come again in Greece and blackmore’s night come to greece! i like blackmore’s night and their music is lovely,but my dream is,i see consert mkII. Chris, I agreed with you up until you said Steve wasn’t dexterous. Really? Ever seen or heard Steve play Hard Loving Man? It’s almost as though he came up with it himself!